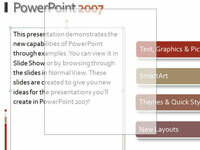 Although there are several ways to position PowerPoint 2007 objects on a slide, the easiest way to move them is to drag them to a new position. 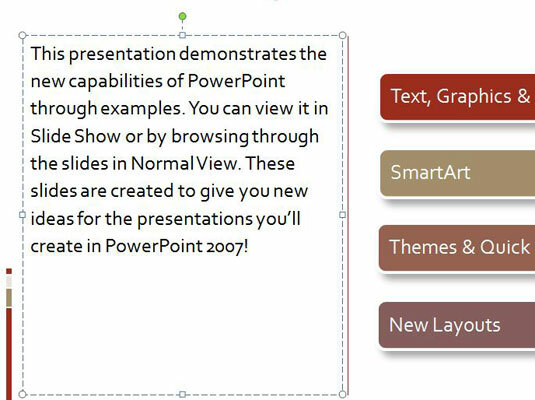 1Select the object on the PowerPoint slide. Move the pointer over the object and click when you see the four-headed arrow. (Click the perimeter of text boxes to select them). 2Hold down the mouse button and start dragging. As you drag, a shadow object shows you where the object will land when you release the mouse button. 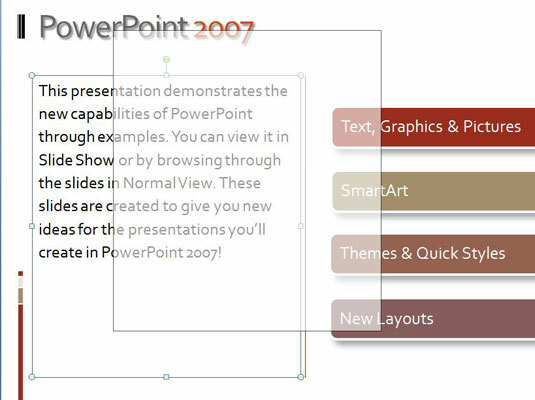 Hold down the Shift key as you drag to move a PowerPoint 2007 object horizontally or vertically in a straight line. Hold down the Alt key as you drag to override the Grid settings so you can move the object by smaller increments than the grid allows. 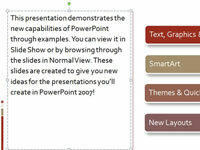 3Release the mouse button when you have moved the PowerPoint object to the right place. The object appears where you placed it.